Sudoku is a very popular and addictive logic puzzle. 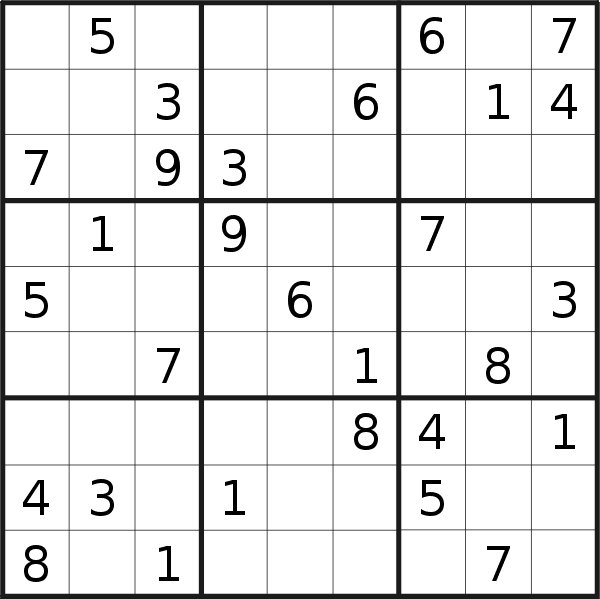 To learn more about how to play sudoku check the 'Rules of Sudoku' section, then dive in and play any of the many very easy puzzles available here. Each day we publish one new puzzle that you can play online using our easy to use flash based sudoku player. You may also download the daily puzzles in printable pdf format. On this page, you will always find the puzzle of the day. Today's puzzle is rated 'moderate'. Click 'play online' to launch the flash sudoku player or click 'Print' to download the pdf version. To select a different puzzle check the links on the left of this page, where you can find a selection of puzzles ranging from very easy to very hard. 7sudoku.com also offers monthly and seasonal traditional sudoku puzzle packs that you can print. All puzzle packs come complete with solutions at the end of the book. Check the downloads section to see what's available right now. One last thing: All sudoku puzzles published on this website have only one solution and can be solved using logic. We do not publish puzzles that require guessing.